Native Hoosiers and Transplants Alike! Dress up in your best threads (from any era! ), put on your dancing shoes, and come celebrate Indiana's Bicentennial at the Harvest Moon Ball at the Masonic Temple in Crawfordsville on October 8. The Juniper Spoon will be serving up General Lew Wallace's favorite Hoosier hors d'oeuvres, and we'll all be snapping our fingers to the City Swing Band. The grass is so lush and green right now. As August enters in, the garden continues to share her goodness. Nurturing our bellies and souls. Blossoms add in their own say with pops of color and entertaining the butterflies and our bees. Soon the big yellow bus will be turning the bend to pick up the kids of the lane. Our summer begins preparing for the fall. This mix up is a perfect dish to share at any gathering. 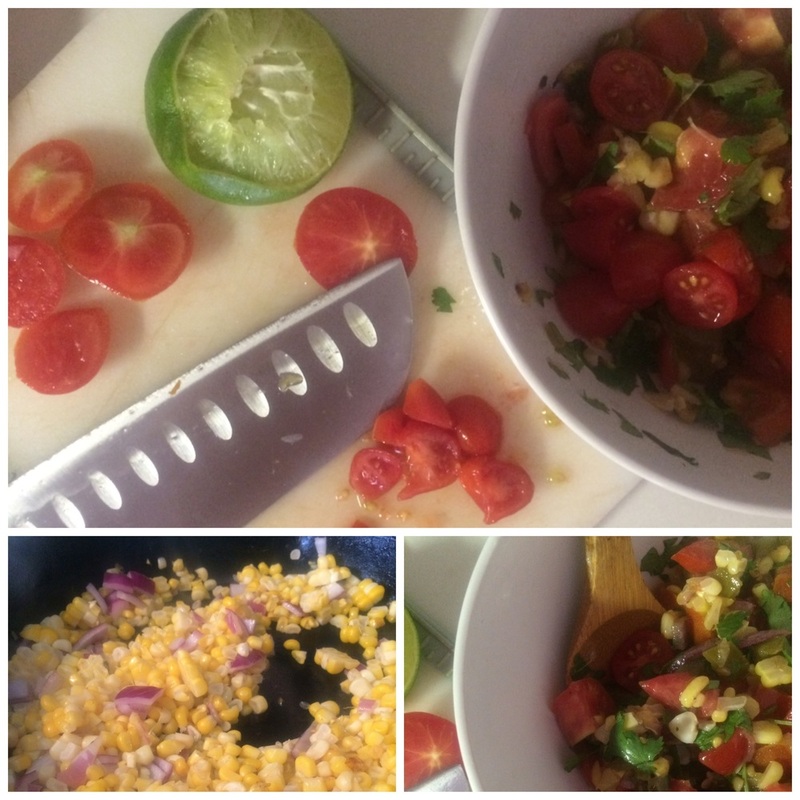 It adds a twist to traditional salsa and can also be used as a salad topper. Grilled shrimp and chicken are also a sweet add! Try roasting the sweet kernels in a cast iron skillet with a tablespoon of olive oil and a dash of salt before adding to the mix! This adds a smokey flavor to the salsa. Fresh and simple! The way we like it. 4-5 ears of sweet corn (We used our local friends, Hole's sweet corn we picked up at the farmers market. Take the corn kernels off the cob with a knife. Chop and dice all your ingredients. Once they are prepped, add them to a large bowl, toss gently. Serve with chips for a simple summertime treat! Want to make it a meal? Just serve with grilled chicken or shrimp! salad and syrups. But sometimes the biggest ones shouldn't go to pie. Really. from the window. Yard life. Here we peer out of the big kitchen window and see summers progression. The deep greens have taken over. The recent rains have soften the lush yard and the chicks dig in for daily snacks. Our garden continues to grow, and we use the ripe produce in many of our dishes. The fireflies are here! Lighting up the evening sky, Just in time for this weekend's festivities. Around here, you can't help but notice these shifts in the seasons. Looking out that window is just part of our daily jam. The green of summer has taken over our yard. The blossoming fruit trees have moved from pinks to lush green, filled trees. The garden is showing thanks for the rich compost we have been feeding it and the linens wave gently in the warm breeze, on the old clothes line. We watch all of this unfold from the window, as we chop, knead and listen to NPR. Noticing the changes summer brings. The week is off to a busy start, full of upcoming events where we get to share in the story. We like that! we Gather. A Night in China. Saturday night we gathered with our community, supporting our local arts for the Athens Arts Gala. The Masonic Temple took on the colors and scents of China. Deep reds, splashed with greens of bamboo on the tables. Students from the college shared their beautiful calligraphy and musical talents. Our days tend to be so busy, getting to slow down and have time with our friends is a nice reminder that working together as a community is a sweet way to spend an evening. Athens Arts creates opportunities for our local artists to display their work and also provides educational enrichment programs for the community. Please be sure to stop by and take it all in! comforting potatoes with an aioli, and this is just the start! Please include name and how many spots are being reserved! Payment will be at the door like last time, cash, credit or check! Price: $30/person or $100/4 people. This makes for a really sweet date night. Grab another couple and pay together! Includes: 4-5 food stations -- BYO beer or wine. We look forward to gathering with you Friday night! Let's all gather for an evening of community and hearty foods to start off this new year! As our earth begins to prepare for the spring blossom we tend to stay inside, but at The Juniper Spoon we like to gather our community to catch up with friends. We will be featuring the last of our 2015 harvest, delighting in local meat, eggs and veggies! Price: $30/person or $100/4 people. Welcome to our brand new blog! Not only have we recently amped up our website to reflect what we're all about (namely local food catering, sustainable farming practices, delicious culinary delights, and everything Montgomery County and Central Indiana) but we've added a blog so that our friends and followers can keep track of what's going on and where we're headed next! We'll keep you updated on noteworthy catering events, exciting local things to do, cooking advice and what's going on at our farm. We'll jump right in and fill you in on how our winter is going. While the winter has been long and cold, the kitchen was abuzz last week with preparation for one of the most exciting events of the year. The Indiana Small Farms Conference takes place annually at the Hendricks County fairgrounds in Danville. At the event attendees enjoy interactive talks held by specialists on topics that range from livestock management to small farm solar energy, and beekeeping and so many more interesting subjects. For the 3rd year in a row, The Juniper Spoon catered the event, representing our local farmers by using their produce and products in our cooking. This event embodies so much that we love about where we live and what we do: sustainable agriculture, local community, enthusiasm for locally grown food, and plain old down to earth people doing what they love and believe in. A few highlights from the weekend menus were the flatbread pizzas made with locally grown and milled wheat flour, and a make-your-own taco bar with a colorful spread of ingredients. We believe with all our hearts that farmers who grow good food should eat good food too! And, of course, plenty from our own garden that we froze at peak ripeness: grilled eggplant, grilled poblano peppers, tomatillos, zucchini, basil pesto and tons of salsa! Now that winter is coming to a close and temperatures are rising, the growing season has already begun! Here at The Juniper Spoon, the alliums are seeded and sprouting in the greenhouse, and our overwintered garlic is poking through the heavy layer of mulch we applied last season. Check back regularly to see what we're growing, cooking and planning. Leave your comments and questions as we love to interact with our friends and guests!